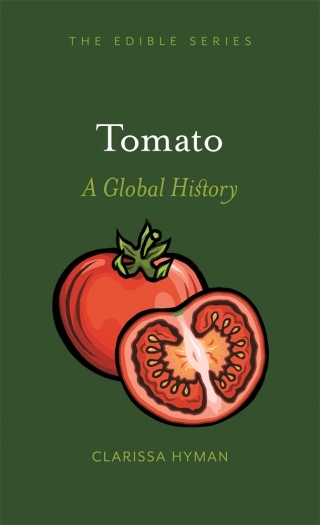 In the history of food, the tomato is a relative newcomer but it would now be impossible to imagine the food cultures of many nations without them. The journey taken by the tomato from its ancestral home in the southern Americas to Europe and back is a riveting story full of discovery, innovation, drama and dispute. Today it is at the forefront of scientific advances and heritage conservation, but the tomato has faced challenges every step of the way into our gardens and kitchens including the eternal question: is it a fruit or a vegetable? Clarissa Hyman charts the eventful history of this ubiquitous everyday item that is often taken for granted. Hyman discusses tomato soup and ketchup, heritage tomatoes, tomato varieties, breeding and genetics, nutrition, tomatoes in Italy, tomatoes in art, and tomatoes for the future. Featuring delicious modern and historical recipes, such as the infamous ‘man-winning tomato salad’, this is a juicy and informative history of one of our most beloved foods. Clarissa Hyman is a food and travel writer who contributes to a wide range of publications. Her previous books include The Jewish Kitchen (2003), Cucina Siciliana (2004) and Oranges: A Global History (Reaktion, 2013). Based in Manchester, she has twice won the Glenfiddich Food Writer of the Year Award.